Spectacular Spuds, They’re What’s For Dinner. You are here: Home / Main Dish / Spectacular Spuds, They’re What’s For Dinner. Today, I’ll show you two delicious things to do with the humble spud. But first, I want to be sure you know how to make perfect baked potatoes with crisp flavorful skin and a gloriously fluffy interior! Taking a wee bit longer to do it right is worth it, believe me. And baked potatoes aren’t just a butter sponge to serve on the side. No sir! They can become a meal in themselves and a darn satisfying one at that! So some evening or some Saturday, turn on your oven and bake up a few and a few extra. It only takes minutes to prep and then the dry oven heat happily works its magic. 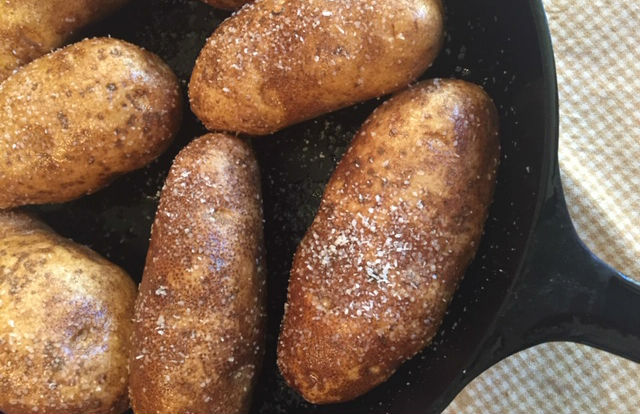 Idaho Russet potatoes make fantastic baked potatoes. The warm Idaho days, cool nights and volcanic soil give them fantastic terroir. Their low moisture content makes them ideal for baking. 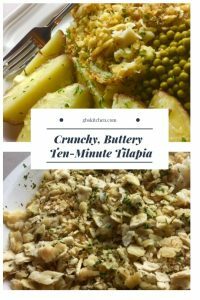 If you’re mashing, dicing, or frying potatoes, appearance and size doesn’t matter much. When baking potatoes, however, choose uniformly shaped and evenly sized ones that have minimal blemishes. Six to eight ounce taters are a great size for a side dish or as a base for a main dish. Scrub potatoes with a nylon scrubber and dry them well with a terry towel. This helps the olive oil stick to the skin. 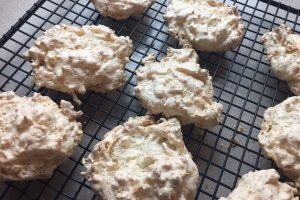 I bake a batch in my cast iron skillet but you can use a pie plate or baking pan. Drizzle olive oil generously over the potatoes and using your hands, roll and rub as much oil on the skins as will stick. 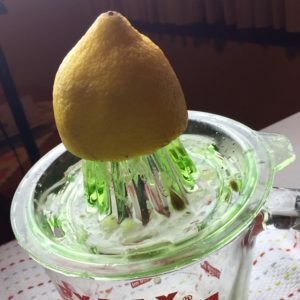 (Rub your hands together after you’re done and remove the excess with a paper towel- your hands with be soft and smooth!) Now lightly sprinkle some kosher salt over them and slide them into a 350 degree oven. After about an hour, check. They should pierce easily with a skewer. The skins will be shiny and crisp and the most flavorful you ever tasted! Give them a bit more time if they’re not quite there. Your patience will be rewarded. If you’re serving these alongside meatloaf, steak or chops you’re there. Add your favorite naughty toppings and enjoy! 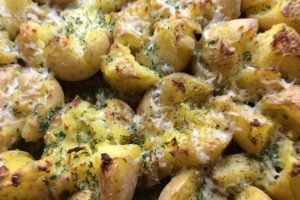 Stuffed Baked Potatoes make a super supper! We love them because they are easy, cheap and satisfying. They’re a great way to use up leftover taco meat, bits of ham, meatloaf, chicken or spaghetti sauce. 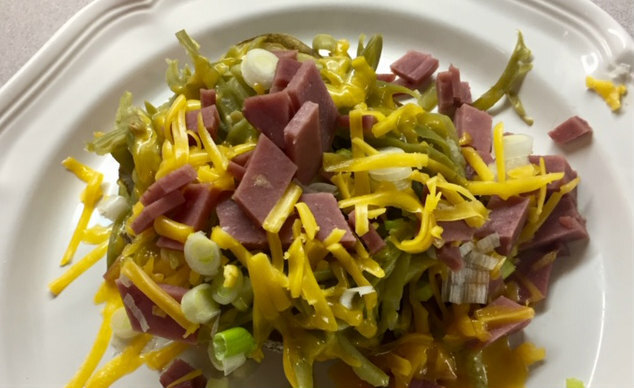 You can add grated cheese, green onions, even baked beans or hot dogs. Often times I toss on a can of french cut green beans or tiny peas that I have heated and drained. Growing up, we called them “tip-the-refrigerator nights” when we cleared out all leftovers and this is a perfect way to use them up. No leftovers? How about a can of chili over the top? Anything goes with baked potatoes. I’d love to hear what you come up with! 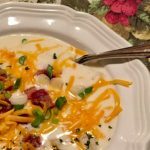 Loaded Baked Potato Soup! I saved the best for last! Years ago there was a restaurant in Overland Park, Kansas that was real close to the Merchandise Mart where we had showrooms and went to gift market for our store. 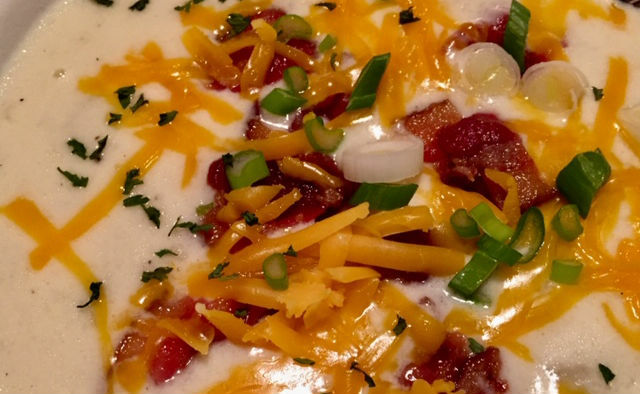 I’ve forgotten the name of it but my daughters and I discovered that every Thursday night they featured Loaded Baked Potato Soup made with all their leftover baked potatoes. Folks flocked there to eat it. It was such a treat and over time I’ve come up with a pretty close copycat version. I’m happily sharing it here for you! 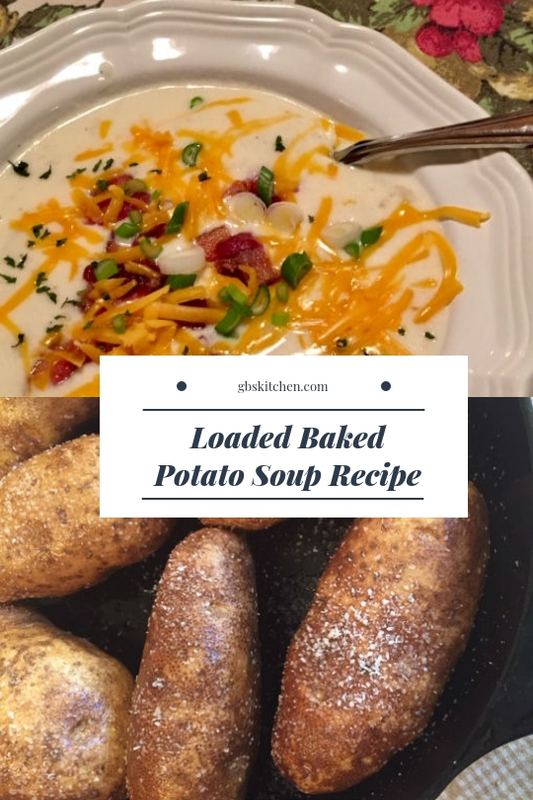 Next time you bake a batch of potatoes, allow for some “plan-overs” that you can use to make this incredibly delicious soup! Hearty, creamy, chunky, rich and savory soup that duplicates all the goodness of a loaded baked potato but in a bowl! Put cubed potatoes in stock pot with 2 cups water and chicken base. Heat through and mash slightly but leave some chunks. Add 2 cups milk, butter, and sour cream. Heat to simmer but don't boil. Dissolve corn starch in 1/4 cup milk, mix thoroughly and add to soup mixture. Stir until soup thickens to desired consistency. Ladle into bowls and top with bacon, cheese, and sliced green onions. Add parsley for garnish if you like. Eat, pat belly and smile. That’s all there is to it!! We love the crispy skins so much that I save part of them and chop ’em up to add with all the other goodies! Heaven in a bowl! 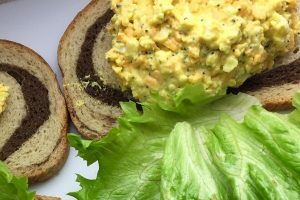 I have a question about this recipe – first you mention butter in the ingredients but I can’t find a part of the recipe to add it. Secondly, is the cheese just to be divided and put on top of the soup or do you mix that in too? EEK, you caught me! Butter goes IN the soup (I fixed that part and cheese goes on top!! Thank you for catching that and giving me the chance to correct it!